Biography of martyrs. Early in its existence the Christian Church began to register the judicial proceedings against its martyrs and saints. These records, called "Acta Sanctorum," took the form of calendars, menologies, "menæa," or "legenda passionalia." Since the anniversaries of the deaths of the saints were celebrated by the sacrifice of the mass, the calendars were merely lists arranged according to the secular yearand intended only for the use of individual churches. The martyrologies, which were introduced in the seventh century, were an amplification of the calendars, and contained short biographies, and lists of the festivals of other churches. The arrangement of these books clearly appears in the present official "Martyrologium Romanum." The third class of stories, the "Vitæ Sanctorum," had the alternative name of "legends," as being intended both for private and for public reading. Israel likewise has its "saints," though the word is used in an entirely different sense from that employed by the Christian Church. Only a brief portion of the liturgy is set aside for commemorating the martyrs of Israel, and the literature on the Jewish heroes of the faith is comparatively small. The "Ḳedoshim," the saints of Israel, had merely fulfilled their religious duty when they steadfastly endured torture and death. 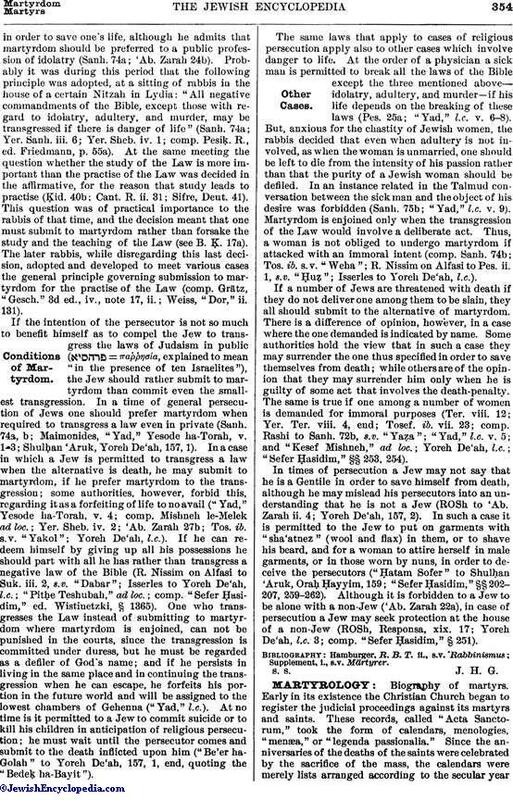 Their widows did not marry again, since their murdered husbands still lived in liturgical poems, simple notices, or formal narratives, and in single lists; in Germany these lists were read at the Hazkarat Neshamot to the community, which, on the Sabbaths before Pentecost and before the anniversary of the destruction of Jerusalem, as well as on the 9th of Ab, commended the souls of the martyrs to the mercy of God. The lists of the places of martyrdom and of the martyrs contained in the Memor-Books may in a certain sense be called "martyrologies," although there were also independent works bearing this name. Schudt ("Jüdische Merkwürdigkeiten," iv. 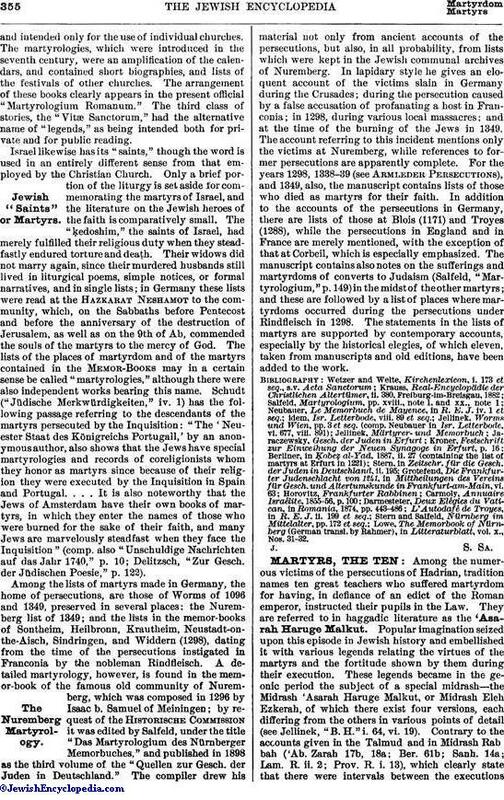 1) has the following passage referring to the descendants of the martyrs persecuted by the Inquisition: "The 'Neuester Staat des Königreichs Portugall,' by an anonymous author, also shows that the Jews have special martyrologies and records of coreligionists whom they honor as martyrs since because of their religion they were executed by the Inquisition in Spain and Portugal. . . . It is also noteworthy that the Jews of Amsterdam have their own books of martyrs, in which they enter the names of those who were burned for the sake of their faith, and many Jews are marvelously steadfast when they face the Inquisition" (comp. also "Unschuldige Nachrichten auf das Jahr 1740," p. 10; Delitzsch, "Zur Gesch. der Jüdischen Poesie," p. 122). Among the lists of martyrs made in Germany, the home of persecutions, are those of Worms of 1096 and 1349, preserved in several places; the Nuremberg list of 1349; and the lists in the memor-books of Sontheim, Heilbronn, Krautheim, Neustadt-on-the-Aisch, Sindringen, and Widdern (1298), dating from the time of the persecutions instigated in Franconia by the nobleman Rindfleisch. A detailed martyrology, however, is found in the memor-book of the famous old community of Nuremberg, which was composed in 1296 by Isaac b. Samuel of Meiningen; by request of the Historische Commission it was edited by Salfeld, under the title "Das Martyrologium des Nürnberger Memorbuches," and published in 1898 as the third volume of the "Quellen zur Gesch. der Juden in Deutschland." The compiler drew his material not only from ancient accounts of the persecutions, but also, in all probability, from lists which were kept in the Jewish communal archives of Nuremberg. In lapidary style he gives an eloquent account of the victims slain in Germany during the Crusades; during the persecution caused by a false accusation of profanating a host in Franconia; in 1298, during various local massacres; and at the time of the burning of the Jews in 1349. The account referring to this incident mentions only the victims at Nuremberg, while references to former persecutions are apparently complete. For the years 1298, 1338-39 (see Armleder Persecutions), and 1349, also, the manuscript contains lists of those who died as martyrs for their faith. In addition to the accounts of the persecutions in Germany, there are lists of those at Blois (1171) and Troyes (1288), while the persecutions in England and in France are merely mentioned, with the exception of that at Corbeil, which is especially emphasized. The manuscript contains also notes on the sufferings and martyrdoms of converts to Judaism (Salfeld, "Martyrologium," p. 149) in the midst of the other martyrs; and these are followed by a list of places where martyrdoms occurred during the persecutions under Rindfleisch in 1298. The statements in the lists of martyrs are supported by contemporary accounts, especially by the historical elegies, of which eleven, taken from manuscripts and old editions, have been added to the work. Lowe, The Memorbook of Nürnberg (German transl. by Rahmer), in Litteraturblatt, vol. x., Nos. 31-32.